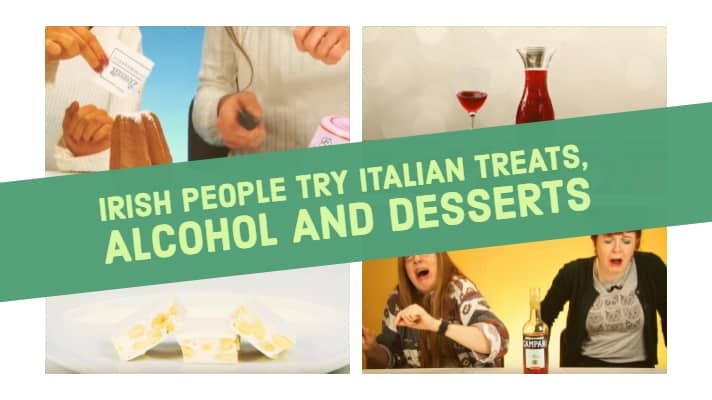 Irish people try a whole lot of Italian things! I love going through old viral videos on YouTube, especially when they are Irish related! Over the years so many of these come and go and it is lovely to relive them again! I am thinking about making a themed day of the week where I feature an old viral Irish video. Think this is a good idea? Let me know in the comments. Today’s selection of videos was…surprisingly entertaining. I found myself laughing out loud while watching these videos. You might remember all these videos from a few years back, they involved X person tastes X for the first time. I believe Buzzfeed was the first to start the trend but I could be wrong. Anyway, it is always entertaining to see Irish people tasting anything for the first time. This time they are tasting some Italian desserts, Italian alcohol and Italian treats, personally, I haven’t been to Italy(I know!) but these deserts do look like something I will taste when I get over there. Anyway, that is enough talk from me, don’t forget to get your weekly dose of Irish straight to your inbox every Friday right here! Before I get to the videos, let me just say that the thumbnails on their videos are epic haha! Italy has all sorts of lovely sweet delights and we thought why not let our Irish people eat a bunch of them and see how much they like them. I saved the best for last! This video has just shy of 1.2 million views and was very entertaining. Let me also say I have tasted Campari and nobody in their right mind drinks Campari pure haha. Hope you enjoyed this collection of Irish people trying various Italian things. If you are looking for more Irish humour I recommend to start on my Irish jokes section. Thanks for stopping by and have a great day! If you are on Pinterest be sure to follow me and Pin the image below. P.S Next week I will be doing Irish people try American food!